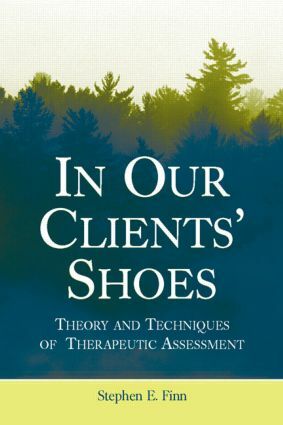 In Our Clients’ Shoes conveniently assembles a number of important papers on the Therapeutic Assessment approach in one resource, explicating its history, theory, techniques, as well as its impact on clients and assessors. Author Stephen E. Finn incorporates pieces presented at various conferences over the past 13 years, in addition to previously unpublished work, with the intent to allow psychologists greater insight into their clients’ perspectives. In Our Clients’ Shoes is appropriate for all clinicians who wish to further impact the lives of their clients and enhance their own wisdom, compassion, and personal and professional development. Contents: Fischer, Foreword. Preface. Part I: The History and Development of Therapeutic Assessment. Introduction: What Is Therapeutic Assessment? Appreciating the Power and Potential of Psychological Assessment. Therapeutic Assessment: Would Harry Approve? How Therapeutic Assessment Became Humanistic, with Mary E. Tonsager. Part II: Specific Techniques of Therapeutic Assessment. Testing One’s Own Clients Mid-Therapy With the Rorschach. Giving Clients Feedback About “Defensive” Test Protocols. Assessment Feedback Integrating MMPI-2 and Rorschach Findings. Assessment Intervention Sessions: Using “Softer” Tests to Demonstrate “Harder” Test Findings to Clients. One-Up, One-Down, and in Between: A Systemic Model of Assessment Consultation. Therapeutic Assessment of a Man With “ADD”. Collaborative Sequence Analysis of the Rorschach. Using the Consensus Rorschach as an Assessment Intervention With Couples. “But I Was Only Trying to Help!”: Failure of a Therapeutic Assessment. Collaborative Child Assessment as a Family Systems Intervention. Teaching Therapeutic Assessment in a Required Graduate Course. Part III: Theoretical Developments. Please Tell Me That I’m Not Who I Fear I Am: Control-Mastery Theory and Therapeutic Assessment. Challenges and Lessons of Intersubjectivity Theory for Psychological Assessment. How Psychological Assessment Taught Me Compassion and Firmness. Conclusion: Practicing Therapeutic Assessment. This innovative series is devoted to grasping the vast complexities of the practice of counseling and psychotherapy. As a set of healing practices delivered in a context shaped by health delivery systems and the attitudes and values of consumers, practitioners, and researchers, counseling and psychotherapy must be examined critically. By understanding the historical and cultural context of counseling and psychotherapy and by examining the extant research, these critical inquiries seek a deeper, richer understanding of what is a remarkably effective endeavor.